British expats d'uncertain age may recall Wesley "Two Scoops" Berry. The American was a contestant on Gladiators and had a party trick that saw him able to jump, without assistance, over a car. Pretty impressive, no doubt. 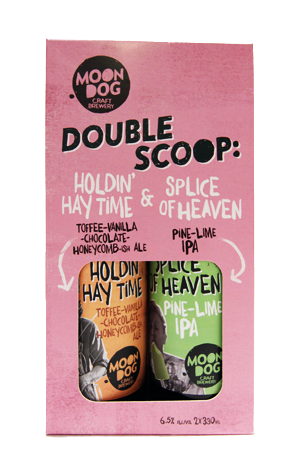 But as impressive as releasing a double scoop of ice cream themed beers in a two-pack bearing colours of lurid pink, orange and green? We reckon that could prove a leap too far for even Two Scoops. But for the mentalists at Moon Dog? No Biggie. It's the second time they've opted to pop two beers out at once, following the pairing that was designed to be mixed together to create a beery take on an Old Fashioned cocktail. This time around, the pair is united by their mimicking of ice creams. One, the Splice of Heaven has already been written about on this site: it's an IPA brewed with Beer DeLuxe earlier in the year that uses lactose to recreate the inside of Splice ice creams and fruity hops for the outer layer. Such was its success that the man whose beers swept the board at last year's inaugural Craft Beer Awards has been inspired to create something similar at Modus Operandi. Its partner in rhyme is Holdin' Hay Time for which you can probably imagine the inspiration. Using all manner of specialty malts plus rolled oats, lactose, vanilla, cacao and honey, the aim was to mimic that lip-smackingest of cold treats, with the result a creamy, chocolatey, biscuity, nutty, caramelly beer; imagine a full-bodied amber ale shot through with a dose of lactose. Unlike Coughlin's Diet, we're told these two aren't designed to be mixed together, merely packaged so because of their familial ties. However, we'd wager there will be much mixing taking place so we gave blending a go and... Do it! The lime and citrus hops of the Splice stick around while the rich maltfest of the Hay Time softens the former's bitterness to create what's possibly more balanced than either of them flying solo.